You represent and warrant that: (i) You have the capacity to enter into a legal agreement in the province, state, territory or country in which You reside; and (ii) your use of any of the Site that You use will not violate any applicable law or regulation in the province, state, territory or country from which You are accessing the Site. When signing up to be a Registered User of the Site, You represent and warrant that any information You provide about yourself to ECHOage is correct. While You are a Registered User, You will keep Your registration information provided to ECHOage current by providing ECHOage regular updates and corrections to it, so that ECHOage’s information about You remains correct and current. If You are given a personal username and/or a password for the purpose of accessing certain features of any of the Site or participating in certain activities run via the Site, You are responsible for all activities conducted under that username or password, and You will take all necessary steps to ensure that no one other than You uses that username or password and that that password is kept confidential. If You have any reason to believe that any password assigned to You has become known to or been used by any other person, You will inform ECHOage immediately. You will be asked to suggest one or more usernames when You register with the Site. Please note that the assignment of a username to You is in ECHOage’s sole discretion. As well, ECHOage may, at any time, change any username or password assigned by ECHOage to You. ECHOage will notify You when it does so. Each Registered User may create a personal profile that is visible to visitors to the Site (a “Personal Profile”). A Registered User’s username will be displayed as part of his or her profile. A Registered User may choose to include further information in his or her Personal Profile. You may create a profile on the Site to promote a party that you are hosting (a “Party Profile”). By creating a Personal Profile or a Party Profile, You: (i) agree to administer the profile so that it contributes to the Site in a positive manner and is not disruptive; and (ii) represent and warrant to and covenant with ECHOage that You are authorized to do so by the person for whom the party is being thrown. 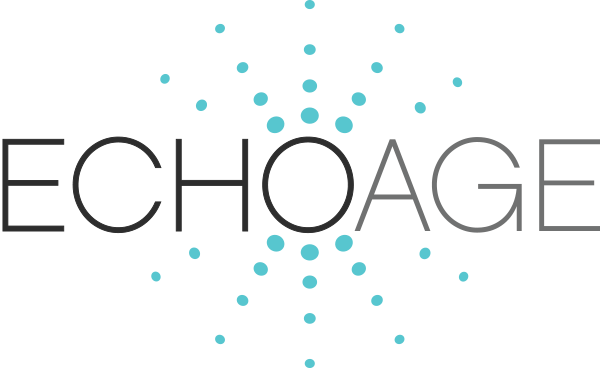 From time to time, You may choose to ask, make or provide questions, suggestions, ideas, comments, recommendations, feedback, requests or other information relating to the Site (“Feedback”) to ECHOage. By providing any Feedback to ECHOage, You: (i) agree that the Feedback is not confidential; and (ii) assign all right, title and interest in and to the Feedback to ECHOage including all intellectual property rights. ECHOage shall be entitled to the unrestricted use and dissemination of any Feedback for any purpose (commercial or otherwise) without any acknowledgment of or compensation to You. The contents of the Site, including any and all information, content, links, reports, data, databases, tools, e-mail, code, photographs, pictures, video, postings, graphics, interfaces, web pages, text, files, software, product names, company names, trade-marks, logos, trade names, or other materials contained on or in the Site is the “Content”. The Content includes materials contributed to the Site by or on behalf of ECHOage (the “ECHOage Content”) and materials contributed to the Site by Users of the Site (“User-generated Content”). By submitting or sending any material to ECHOage for inclusion as User-generated Content or otherwise making it available for display on or through the Site, You acknowledge that the materials are your User-generated Content and You grant ECHOage the royalty-free, unrestricted, world-wide, perpetual, irrevocable, non-exclusive and fully sub-licensable right and license to use, reproduce, modify, adapt, publish, translate, create derivative works from, distribute, perform and display such User-generated Content (in whole or part) and to incorporate it in other works (in each case irrespective of the form, media, or technology used) for the purpose of allowing ECHOage to: (i) administer the Site; (ii) operate the Site (including apply for funding or sponsorship of any Site and reporting on the effectiveness of the Site to those who fund or sponsor the Site); (iii) display and distribute the Site; and (iv) promote the Site including but not limited to allowing other sites to link to Content on the Site or displaying Content from one Site on another Site. You acknowledge that ECHOage may also need to do the following in order to operate, display or distribute the Site and agree that ECHOage may do so: (i) transmit User-generated Content over various networks; and (ii) reformat User-generated Content. You represent and warrant to and covenant with ECHOage that: (i) You have now and that You will continue to have all necessary rights and authority to grant the licenses set out in the preceding section; and (ii) the User-generated Content that You contribute to the Site will not infringe any proprietary right of any third party. You also represent and warrant to ECHOage that any “moral rights” in any User-generated Content that You contribute to the Site have been waived prior to their contribution and that ECHOage, and its successor and assigns may rely on those waivers. You agree that all User-generated Content that You contribute will not be considered confidential. You should maintain a back-up copy of any User-generated Content that You contribute to the Site. In any event, ECHOage will not provide a copy of that User-generated Content to You. Additionally, ECHOage is not responsible for User-generated Content that is lost or destroyed for any reason. ECHOage assumes no obligation to update the ECHOage Content. ECHOage reserves the right to change any and all ECHOage Content at any time without notice. ECHOage, its licensors and suppliers, are not responsible for any Content other than the ECHOage Content. You agree not to link to any page forming part of the Site other than the home page of the Site or the Party Profile for a party that You are hosting or have hosted without ECHOage’s prior written approval. ECHOage reserves the right, in its sole discretion, to reject, refuse to post, remove or block access to any Content that is available via or on the Site at any time, without notice and without liability. Unless You have obtained ECHOage’s permission in writing to do so, You may not post advertisements for commercial products to the Site as part of your User-generated Content. You acknowledge that the person who contributes any Content to the Site is responsible for that Content. Consequently, ECHOage does not provide any representations, warranties or guarantees with respect to User-generated Content, its quality or its accuracy. Before using or relying on any User-generated Content, You should take reasonable steps to verify its accuracy, completeness or usefulness: You are using it at your own risk. Additionally, views and opinions expressed in materials forming part of the User-generated Content do not necessarily represent the views or opinions of ECHOage. ECHOage acknowledges that social media channels encourage the sharing of materials such as images and videos. You are encouraged to use the Party Profile page for any party that You host to indicate whether or not You permit the User-generated Content that You have posted to that Party Profile to be posted to any Internet site, tweeted or otherwise provided to any social media channel by any person other than You. If You are under the age of 18, ECHOage strongly encourages You to discuss this issue with Your parent(s) or guardian(s). If You are also under the age of 13, You agree to do so. If You wish to post any User-generated Content that is not Your own to any Internet site, obtain permission from the Registered User who posted the User-generated Content before doing so. Please be advised that the payment the invited guest will make to this birthday party is in lieu of a birthday gift. The invited guest will enter their credit card information and enter any amount that they may wish in the payment section. The decision as to how much the invited guest would like to contribute to the birthday child is at the discretion of the invited guest. Refund Policy: Please contact ECHOage if a payment has been made incorrectly and ECHOage will investigate for you and provide a refund where appropriate. Delivery:After all the invited guests have made their payments towards the birthday party, and the host of the party elects to "Close" the ECHOage Party, ECHOage will calculate the total funds contributed. The funds will be divided with a percentage set by the host when the party was created and the correct percentage of funds will be delivered by ECHOage to the party host for the purpose of purchasing birthday gifts for the child. The remaining amount of the available funds will be delivered by ECHOage to the charity selected by the host parent with administrative fees applied. A $2.00 per guest payment administrative fee is applied to the amount of funds given to the person hosting the ECHOage party. Customer Service: All inquires relating to billing or payment can be directed to [email protected] for a quick response. Currency: Payments made for parties hosted in Canada are in Canadian dollars. Payments made for parties hosted in United States are in US dollars. USA Banking: Some banks in the USA charge a small administrative fee when contributions are made online. ECHOage does not apply administrative charges to hosts of ECHOage parties. ECHOage may but is not obliged to review any Content. Even if ECHOage does review, the review may not be to Your satisfaction. You acknowledge this and the consequence that follows from it: Content accessible on or via the Site may include materials that are offensive or otherwise objectionable to You. ECHOage reserves the right, in its sole discretion, to set limits on the amount of User-generated Content that You may contribute. Links to Internet sites not operated by ECHOage are present on the Site (for, example, links to the web pages of the charities that participate in ECHOage’s donation program). ECHOage has no control over such Internet sites or their content. You acknowledge and agree that ECHOage is not responsible for the availability of such links, Internet sites or their content, and does not endorse and is not responsible or liable for any content, advertising, products, or other materials on or available from such Internet sites. You further acknowledge and agree that ECHOage will not be responsible or liable, directly or indirectly, for any damage or loss caused or alleged to be caused by or in connection with use of or reliance on any such content, goods or services available on or through any such resource. Your correspondence or business dealings with, or participation in promotions of, charities or other third parties such as Facebook and Twitter accessible on or via the Site including any contracts arising from those dealings, are solely between You and the third parties. You agree that ECHOage will not be responsible or liable for any loss or damage of any sort incurred as the result of any such dealings or as the result of the presence of social media providers, advertisers or other third parties on the Site. Please note, if You provide any information to a third party (e.g., your contact information or credit card information), such information is collected by the third party and not by ECHOage, even if You made a purchase from a third party web Site that was linked from or framed within the Site. ECHOage reserves the right to communicate with You regarding your use of the Site. You consent to ECHOage’s use of any contact information that You provide to ECHOage in doing so. The content included in any such communication is deemed to be Content made available on the Site by ECHOage. Without limiting the preceding paragraph, ECHOage does not warrant that the Site or any Content: (i) will be available at all times; (ii) will operate without errors; (iii) defects or errors in the Content will be corrected; (iv) will be accessible regardless of the hardware or software that You wish to employ to access it; (v) is absolutely secure, notwithstanding ECHOage’s use of commercially reasonable efforts to secure it; or (vi) is free from viruses or other harmful code. IN NO EVENT WILL ECHOAGE, ITS REPRESENTATIVES OR ITS SUPPLIERS BE LIABLE TO YOU OR ANY PERSON WITH RESPECT TO DAMAGES INCURRED BY REASON OF ANY SERVICES OR GOODS RECEIVED THROUGH OR ADVERTISED ON THE SITE OR RECEIVED THROUGH ANY LINKS PROVIDED ON THE SITES. FURTHERMORE, ECHOAGE EXPRESSLY DISCLAIMS ANY AND ALL LIABILITY FOR THE ACTS, OMISSIONS OR CONDUCT OF ANY THIRD-PARTY USER OF THE SITES OR ANY SPONSOR OR ADVERTISER OF THE SITES. It is the policy of ECHOage to investigate and respond to claims of intellectual property infringement. Names, phrases, words, titles, logos, icons, graphics, images or designs, used throughout the Site and the Content may be trade names, registered or unregistered trade-marks or services marks (the “Marks”) of ECHOage, its subsidiaries, affiliates or licensors, or other entities and individuals. The Marks are protected by Canadian and international trade-mark and other laws. Any use of any of the Marks without the express of the owner of the Mark is strictly prohibited. ECHOage reserves the right, in its sole discretion, to change or modify the Site from time to time including but not limited adding or removing functionality or features or changing its name. ECHOage may change the Site without prior notice to You.